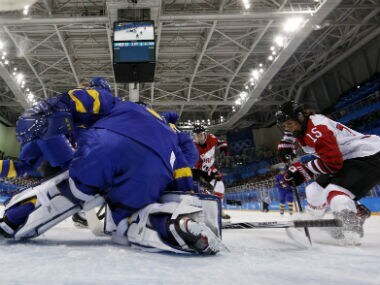 Gangneung: US top scorer Ryan Donato and goaltender Ryan Zapolski rose after being flattened to lead the United States over Slovakia 5-1 and into the Pyeongchang Olympic men's hockey quarter-finals on Tuesday. Harvard University star Donato scored two goals and Zapolski made 22 saves to spark the Americans, who haven't taken Olympic gold since 1980, into a last-eight clash Wednesday against the unbeaten Czech Republic. "We came in feeling confident about not going home. Putting goals in makes us feel a lot more confident," Donato said. "The chemistry is nice and is kind of meshing." Donato, who also netted two goals against Slovakia in a 2-1 group-stage victory, blasted a rebound into the far top corner 96 seconds into the second period to put the USA ahead 1-0. Slovakia responded 26 seconds later with a body-slamming retaliation sequence as Michal Cajkovsky was sent off for 25 minutes for a blow to Donato's head. "I just dipped my head for a second to look at the puck and looked up and had an elbow in my mouth," Donato said. "It didn't feel good. It felt like it might have broken my nose, but it didn't. I'm OK now." At the same moment, Ladislav Nagy was whistled for flattening Zapolski, who was slow to rise off the ice. "He hit my head and pinched my neck," said Zapolski. "It was a little bit of a scary thing." 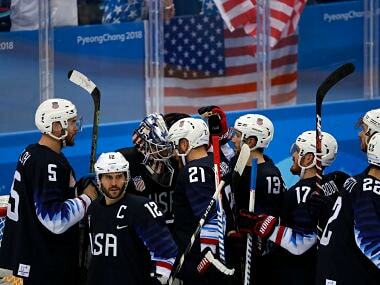 That gave the Americans a two-man power play and they converted just 18 seconds in when James Wisniewski, a German League defenceman whose father Jim was quarantined with the norovirus, scored to provide a 2-0 US edge. "It was huge for our confidence going into tomorrow," Wisniewski said. "We're getting better and better." US college star Troy Terry collected his third assist with 6:30 remaining in the second period, his centering pass blasted home by Mark Arcobello for a 3-0 US lead. Slovakia responded on a power-play goal by Peter Ceresnak with 3:06 remaining in the second but Garrett Roe answered with 10:08 remaining and Donato tucked the puck inside the near post with 3:14 left. "It shows how strong and how resilient a team we are," Zapolski said. "We had our best period of the Olympics in the third." 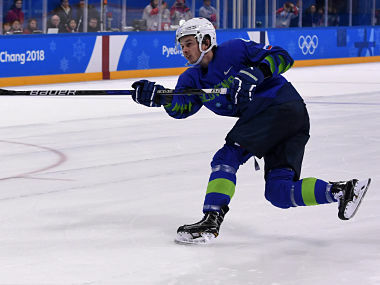 Donato, 21, shares the Olympic goals lead at four with Russians Ilya Kovalchuk and Kirill Kaprizov. "He's a tough kid and you see how much of a natural scorer he is," Terry said. "When you've got a guy that fast and skilled with a shot like that, you have a good chance it's going in the net." Now the Americans must recover in less than a day to face a Czech squad seeking its first Olympic gold in 20 years. "It's a big ask but we will make a good run at it," US forward Chris Bourque said. Later qualifying games Tuesday include South Korea against Finland, Slovenia against Norway and Switzerland against Germany. Also already into the quarter-finals are the Olympic Athletes from Russia, two-time defending champion Canada and unbeaten Sweden.